“Pencil Tower” at the center of the University of Shiga Prefecture. 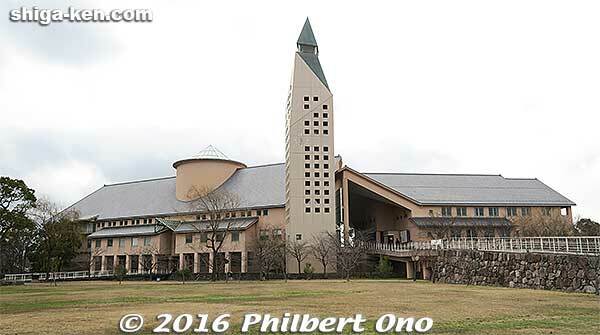 I finally visited the University of Shiga Prefecture (USP or Shiga Kenritsu Daigaku 滋賀県立大学) for the first time in Jan. 2016. It’s a 15-min. bus ride from JR Minami-Hikone Station. 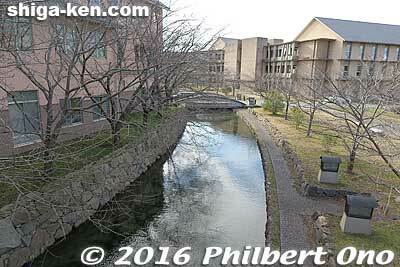 The largely flat, rectangular campus is quite near the shore of Lake Biwa in a rural fishing neighborhood called Hassaka (八坂町) in Hikone. Established by the prefecture, USP is not to be confused with Shiga University (Shiga Daigaku 滋賀大学) which is a national university with a campus adjacent to Hikone Castle. Founded in 1995, USP has an enrollment of about 2,400 undergraduate and 270 graduate students. They have the School of Environmental Science with over 800 students, School of Engineering with over 700 students, School of Human Cultures with almost 900 students, and School of Nursing with about 300. There were 93 foreign students as of May 2015 with 66 of them coming from China. Only four were from the U.S. as exchange students. In the School of Human Cultures, the Department of Intercultural Communications has 200 students learning foreign languages. They are required to learn two foreign languages. That must be really tough. Studying just one foreign language is tough enough. Most of them take advantage of the exchange program to study abroad. Since USP is only 20 years old, the buildings still look new and modern. Different clusters of buildings have different designs to reflect their respective departments such as buildings that look like barns or a hospital. But the most distinctive structure and symbol of the school is a tower nicknamed “Pencil Tower.” It does look like a pencil, but I’m told that it wasn’t designed to look like a pencil. Too bad we cannot go up the tower since the views must be great from the top. The tower does not seem to serve any purpose except as an architectural focal point and reference point to help you get your bearings on campus. 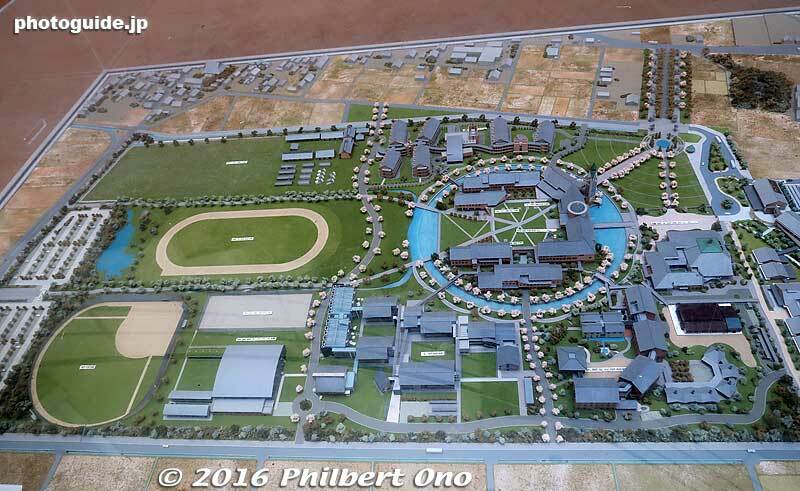 Scale model of USP. 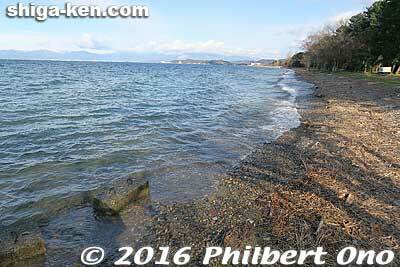 Lake Biwa is toward the top of the photo. The campus is fairly large, including an athletic field and gymnasium. The central buildings are surrounded by a cherry tree-lined circular moat complete with ducks. (The school even has a duck club to take care of the ducks.) The sports facilities are used only for practice and do not have spectator seats since no sports competitions are held at USP. Competitive games are instead held at public sports facilities elsewhere in Hikone. USP has no museum (like the Omi merchant museum at Shiga University) nor outdoor sculptures and art galleries (like at Seian University of Art and Design). So what does USP have that could attract visitors? It’s cherry blossoms. There are many sakura trees at the University of Shiga Prefecture. The ones lining the circular moat would look nice when in bloom. The only thing is, no one knows about USP’s cherry blossoms and Hikone Castle’s cherry blossoms are so famous and easy to get to that no one thinks about seeing cherry blossoms anywhere else in Hikone. USP’s cherry blossoms bloom during spring break when there are hardly any students on campus. The poor cherry blossoms thereby bloom with almost no one to enjoy them. So if you want to enjoy sakura with almost no people around, visit USP around early April. Circular moat and cherry trees. 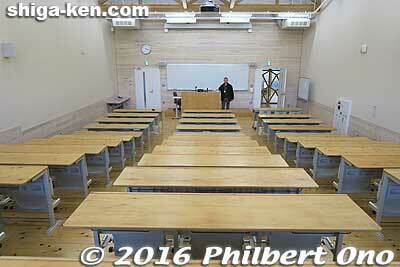 Lecture room with lots of wood. Besides the cherry blossoms, the school cafeteria, Cafe Pianissimo, and the small University Shop are open to the public when classes are in session. Lunch in the cafeteria was good and cheap. 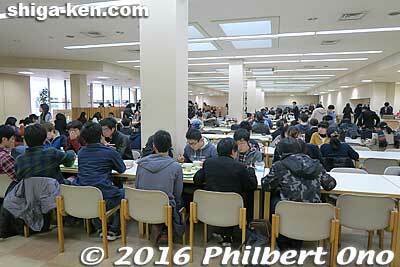 It gets very crowded during lunch time (11 am–2 pm, 6 pm–8 pm). 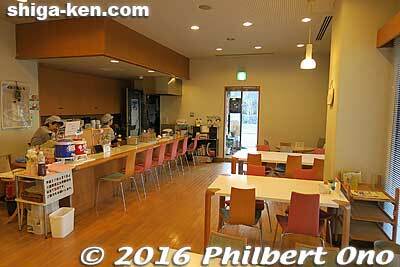 The cafe next to the auditorium was run by a pair of friendly ladies. Good place for coffee and cake. The small University Shop is more like a small, neighborhood convenience store. Although it sells books (including books about Shiga), it doesn’t sell textbooks nor USP merchandise like T-shirts and hoodies. (Textbooks are sold in a special area at the start of each school session.) The only USP-branded item I found was a pink pen with the university’s name in Japanese. There was also a bottle of local sake. I guess the school is not big enough to market USP merchandise which is a shame since it can spark and spread school pride. How about selling pencils having the same design as the Pencil Tower? The USP Pencil Tower pencil. Picture postcards of the school would also be nice. Pen with USP’s name imprinted. Made of recycled materials. Lake Biwa shore in Hassaka, Hikone. USP’s rural, lakeside neighborhood of Hassaka (八坂町) is quite well known among Japanese-Canadians in Canada. Did you know that the largest group of Japanese immigrants to Canada before World War II came from Shiga? 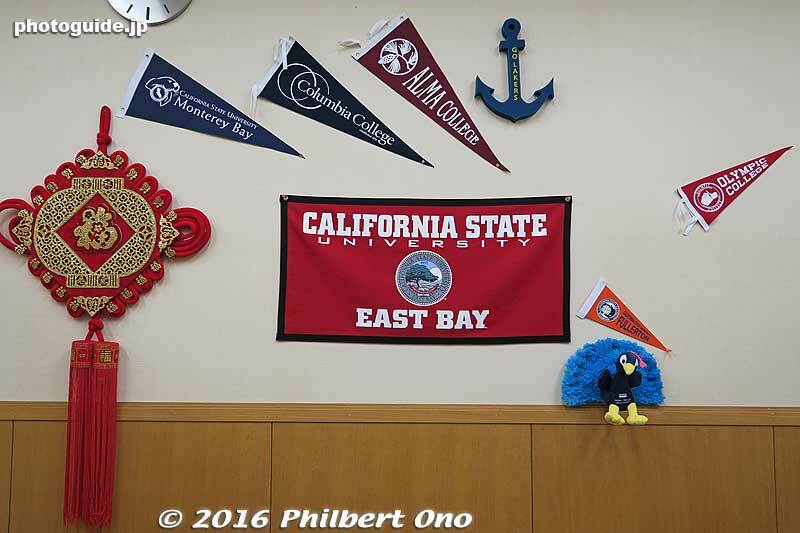 Many came from eastern Shiga, namely Hikone and the old fishing villages of Hassaka and neighboring Oyabu (大藪町). I had thought that most came from Wakayama Prefecture since they even had a museum dedicated to the immigrants. (Too bad that it recently closed.) During WWII, the Japanese immigrants were forced to either relocate to camps in the interior or to return to Japan. So there are descendants in Hikone of those immigrants who returned to Shiga. Sadly, their stories are being lost in Shiga. Even the descendants might not know much about the experiences of their immigrant grandparents or great grandparents. Something I would like to see at USP is a public exhibition space showing the basic history of Hikone’s immigrant past and some immigrant artifacts donated or loaned by immigrant descendants. The oral histories of those who returned to Shiga should also be recorded. (Their numbers and memories are quickly dwindling.) Back in Feb. 2011, Hikone City Hall had a photo exhibition of Hikone’s immigrants for a short time in the lobby. 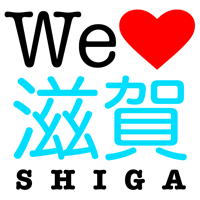 Shiga should have something more permanent and USP would be the ideal place for it. Despite the historical connection with Canada, Shiga has only one sister city in Canada, between Higashi-Omi and Taber, Alberta (not a place where the Japanese immigrated). USP also does not have any student exchange partner universities in Canada. But anyway, USP is a viable choice for students. Somewhat out of the way, but the neighborhood is nice and peaceful. *Special thanks to former USP associate professor Martin Stack for guiding me around USP.